Focusrite's attention to quality shines through with this relatively affordable, gorgeous-sounding, incredibly fast 10-in/4-out Thunderbolt interface. Capable of very low latency. Quality mic preamps with added 'Air'. Good build quality. Very easy to use. No Thunderbolt cable included. Needs external power supply. 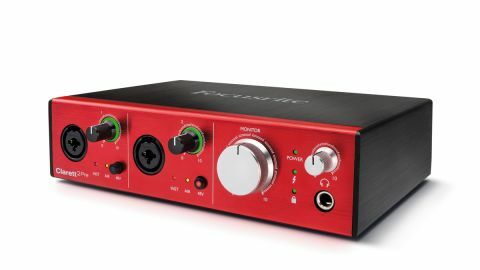 The Clarett 2Pre is the newest and lowliest member of Focusrite's premium-quality Clarett family of Thunderbolt audio interfaces. The front panel hosts two analogue mic/line/ instrument inputs, plus an 8-channel ADAT optical digital input, while alongside the Thunderbolt port on the back are four line outputs, and 5-pin MIDI In and Out ports. The accompanying Focusrite Control application enables patching of inputs and outputs, and configuration of monitoring and channel settings. Also thrown in is a respectable collection of plugins by Focusrite (Red2 and Red3) and Softube (Time and Tone Bundle). It all adds up to a svelte package that makes the Clarett 2Pre ideal for the small-scale studio, where you're only ever going to want to capture a single mono or stereo source at a time. It's currently only compatible with Mac, although Windows support is imminent, we're told. The two front panel inputs are on combi jack/XLR sockets, each with a Gain knob and a phantom power switch. The Gain knob has a surrounding circular light (the 'Gain Halo'), which glows green when an input signal is detected and red when it's verging on clipping. The Inst and Air LEDs are activated in the Focusrite Control software: Inst mode is for use with guitars and other high-impedance instruments, and the Air setting changes the impedance of the mic preamps, giving a "transformer resonance effect" that enhances the mid and high frequencies. The Monitor section on the right hosts the headphone jack and volume knobs for the main Monitor output and the headphone output. The sources for each of these are configured in the Control app, and they can be separately assigned as stereo pairs for a discrete foldback headphone mix, or mirrored on the same pair of outputs. You can also mix in some of the direct input signal if required, but most of the time the Thunderbolt interface allows you to monitor through your DAW, with plugin effects, with no noticeable latency anyway. The immediate appeal of the Clarett 2Pre lies in its ease of use, solid integration with the Control software, and excellent sound. The mic preamps are as clean and quiet as you'd expect from Focusrite - it's what the company does, after all - and boast a dynamic range of 119dB. Combined with the recently improved Clarett AD converters, the results are truly impressive for a device at this price point, and the Air feature really does open up the sound of vocals and other sources. For many, the biggest draw of this diminutive box, though, will be the sheer speed of the Thunderbolt interface and its proprietary drivers, which can give very low play-through latency, thus making it thoroughly problem-free to use, say, software amp sims on your guitar tracks while you're recording. The Clarett 2Pre packs serious punch in terms of both speed and quality, making it a very appealing prospect indeed for project studios. Mobile musicians, however, might be disappointed to learn that it can't be bus- powered by the host Mac, so you do have to plug into the mains to use it.